Re: Objection to the proposed Kinship Care Order in the Children and Young People Bill and request to support an amendment. I am writing to express my concern about the legislative measures in section 10 of the proposed Children and Young People Bill, which will create a Kinship Care Order as a new legal status and accompanying package of support for the majority of kinship care families. As you may be aware kinship carers themselves represented by the Scottish Kinship Care Alliance – the national body for kinship carers, and other organisations, are opposing these measures as they look likely to reduce the support for kinship care families in Scotland. I am asking you, as my MSP, to raise this issue during the Stage 3 debate on the Bill on weds 19th February, to support the amendments submitted by Jayne Baxter MSP on kinship care, and to speak to the Minister for Children and Young People and the Bill team to ensure that these concerns are addressed and remedied before it is too late. If you want more information I can arrange for you to meet with kinship carers in your constituency to discuss this further. It is worth noting that there are at least 20,000 kinship carers in Scotland (or 1 in 71 children in Scotland), and the majority of these suffer poverty and distress caused by taking on extra children according to the Buttle UK’s 2013 report ‘The Poor Relations’. 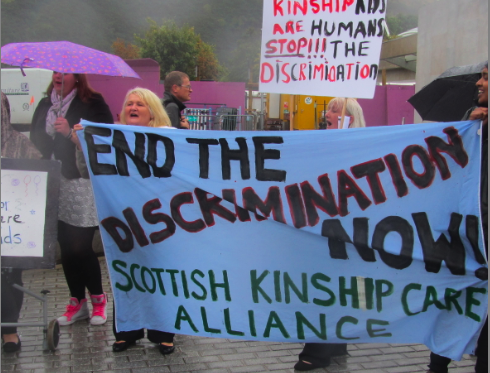 Kinship Carers have asserted, and I very much agree, that support for kinship care children needs to be increased and made equitable across Scotland, not reduced or kept at the current inadequate level. Kinship children should not have a worse life-chance than those in other forms of care, and should have access to same support services in recognition of the comparable need of these children to those in foster and residential care. Basic financial support to keep these families out of poverty should also be provided at a fair and equitable rate across Scotland. Support should be given according to the child’s need not the legal status of the kinship care arrangement. I look forward to hearing back from you on this matter and hope you will address the issue an support Jayne Baxter’s amendment on the 19th February.